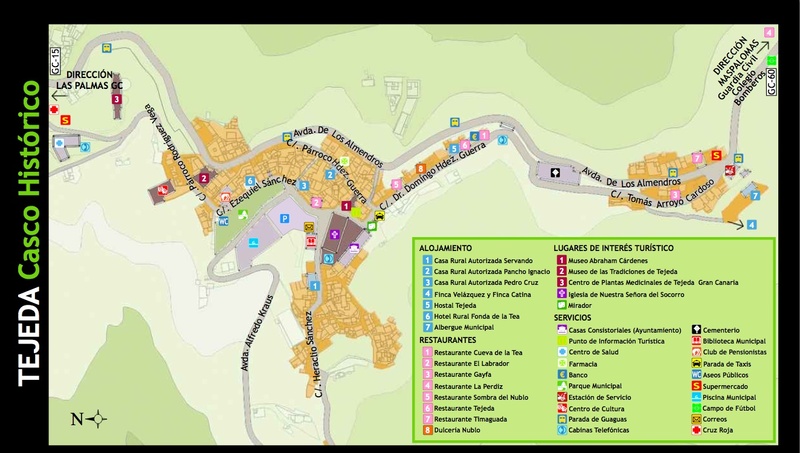 From the airport: by GC – 1 heading towards Las Palmas de GC, then by GC – 110 and later on by GC – 4 always heading towards Tafira – Santa Brigida, until you reach the connection with GC – 15, where you’ll follow the Vega de San Mateo – Tejeda direction. 45 kilometres. From Maspalomas: by GC – 1 until reaching GC – 60 and then heading towards San Bartolomé de Tirajana – Ayacata – Tejeda. 47 kilometres. From Agaete: By GC – 2 heading towards Guía – Las Palmas, then connecting with Hoya Pineda by GC – 220 and heading towards Caideros de Gáldar-Fagajesto-Juncalillo- Artenara. Once you are in Artenera heading towards Tejeda by GC – 210. 42 kilometres. 1.- Global Buses Line 18: Faro de Maspalomas - San Mateo. 2.- Global buses line 305: Las Palmas - Tejeda.